Glasshouse proudly presents an exclusive, experimental performance by Chad Mark Murray and Gareth Watkin live at east London's most beloved record store, Flashback Records. 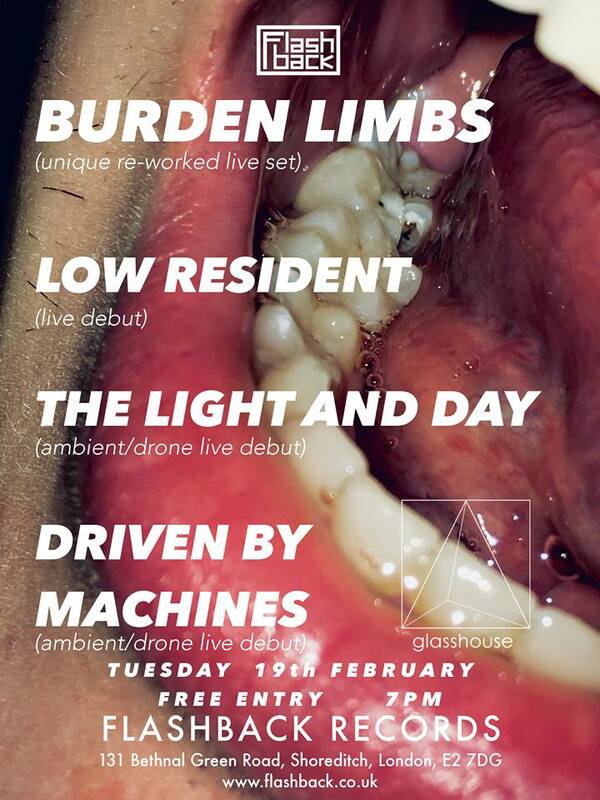 This performance will showcase all forms of the pair's expanding projects through their roots in their respective solo work as ambient electronic musicians The Light & Day and Driven By Machines, and stripped down performances of Low Resident and Burden Limbs. This performance will feature live debuts with a unique performance of improvised and constructed material curated specifically for this event. The pair will be performing collaborative and solo sets, exploring the different voices each musician offers to these works whilst debuting tracks from upcoming releases and performing sneak previews of unheard material. Welcome to the first of what we're hoping will be many Glasshouse blogs posts. Although a rather sombre post as the first, it seems completely fitting for us to start these with a true send off to our favourite rehearsal space, Fat Tank. We heard the news about two weeks ago that the landlords owning some of the warehouse units in Omega Works, north east London, including Fat Tank, had suddenly told the residents they had two weeks to pack up and close their doors. After six years of hard work, blood, sweat, tears, they were gone. Just like that. No reasoning, no leeway, no nothing. We started rehearsing at Fat Tank in late 2017, just as the newly re-formed In Violet were starting to get back to playing again. For the perfectionists who are also in bands, finding the right practice space isn't always easy. I mean of course any box with a set of drums, amps and speakers will suffice, but something about Fat Tank was different. It was obvious from day one that there was an extremely high amount of love and care put into this space by owner's Jack and Daisy, who became very good friends of all the Glasshouse bands over the course of our time rehearsing there. The space consisted of main room or the 'chill out room', which had two sofas surrounded by resident's lock-ups. There were more lock-ups round the corner and the 'Tank room', a large, dusty and metallic smelling room with the actual metal tank that the name came from. Very few had been in to see this as I'm aware, although I was fortunate enough to be shown this by Jack one time. There is a story to this tank's purpose, relating back to the second world war but sadly I can't remember this right now. Maybe I'll edit this post in a few days with the answers. In the main room, the two rehearsal rooms doors faced opposite each other, Tank 1 and Tank 2. These rooms were vibey, spacious, soundproofed to some level, fit with good equipment and always sounded great. They were basically everything that the Glasshouse band's needed, as Burden Limbs and For Breakfast have lots of members, In Violet have lots of gear and all of us can get very loud. These rooms catered exactly for us. Our greatest discovery of Fat Tank and became one of the benefits for us was Chad (Burden Limbs/In Violet) and Oscar (ex-Burden Limbs) conveniently lived a couple of units down, which meant having long practices with a kitchen just a stones throw away was the ideal combination. The addition of the Sainsbury's just down the road was an extra bonus and as a result, we consumed a lot of pizza at Fat Tank during the best part of 2018 thanks to Chad and Oscar's well located oven! Fat Tank was more than a space to plug in, play and leave. From previous experience, your regular commercial practice spaces don't care about you or your band... it's rare they'll even look you up as they're at the desk sat in front of their laptop, asking if your what you're called and if you're have stuff online. Equally, the same can be said about the "each band to their own" mindset in these spaces. Fat Tank was different. The support, help, interest and trust given by Jack and Daisy contributed to making it a hub for inspiration, a place for us to get better as musicians or as full bands, a place to for us to develop creatively and a community of artists and musicians that were on the same level as one another. We have a lot of fond memories from Fat Tank; many hot and sweaty practices, many ideas formulated, many doinks sloinked outside at 11pm on a school night and it will certainly be missed. Thank you Jack and Daisy for making it a special place for us. I'll be visiting for the last time tonight to pop in on For Breakfast's rehearsal and to grab some of Fat Tank's historic memorabilia, which will go towards inspiring us in our new space just around the corner.